John Stomberg reflects on the enriching, educational experience of working with artists, specifically on the Museum's current roster of exhibitions. We’ve had a busy summer preparing for this fall. Professor Tom Wartenberg worked with Mel Bochner on a presentation of the artist’s Range prints. As part of the process, he visited the artist to have in-depth discussions on these challenging prints—just the philosopher, the artist, two chairs and the artwork. While I wish I could have been the proverbial bug on the wall for that conversation, the catalogue we are producing will be a good representation of where they went in their chats. The exhibition is up and looks great thanks to our new assistant curator, Hannah Blunt, who designed the installation with Tom and Mel. At the same time, I worked with Judy Pfaff on her show of sculpture and prints from a particularly exciting period in her career. Happily, during the planning I had the opportunity to visit Judy at her studio—or studios really. It is like a compound of utilitarian buildings that holds everything from possible materials to finished works. I got the sense that I was walking through the architectural version of a Judy Pfaff sculpture. Inside, the workspaces are warm, full, colorful, and always busy with assistants following through on one of Judy’s new ideas or another. She has great gardens, too. Nothing flat and rectangular—her gardens cascade down an incline, and the outlines of the individual beds seem to be growing themselves as if they, too, come from nature. 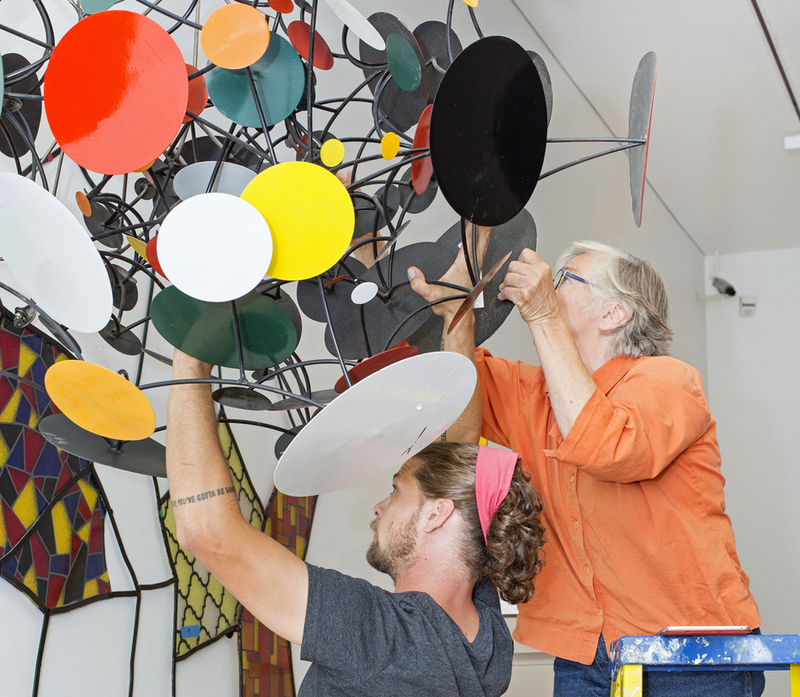 Stay tuned for a blog post on the installation of the Judy Pfaff exhibition. We are thrilled to be collaborating with Mel and Judy this fall. Their intensity is infectious and their creativity is awe-inspiring. Truly, one of the greatest aspects of working in a museum today is spending time learning from great artists. Both will present talks this fall, and I hope you can join us for what promises to be an amazing lecture series.